The village is a fairly small place and we do our best to ensure that we get everyone in as efficiently and safely as possible. We advise everyone to arrive in plenty of time at the village and to follow the instructions of our parking marshals very carefully to ensure that you get parked safely. 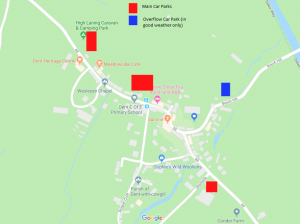 For information the following map shows the locations of the car parks in use, for your own safety and that of all our runners, please do not park on the roadside anywhere on the course.